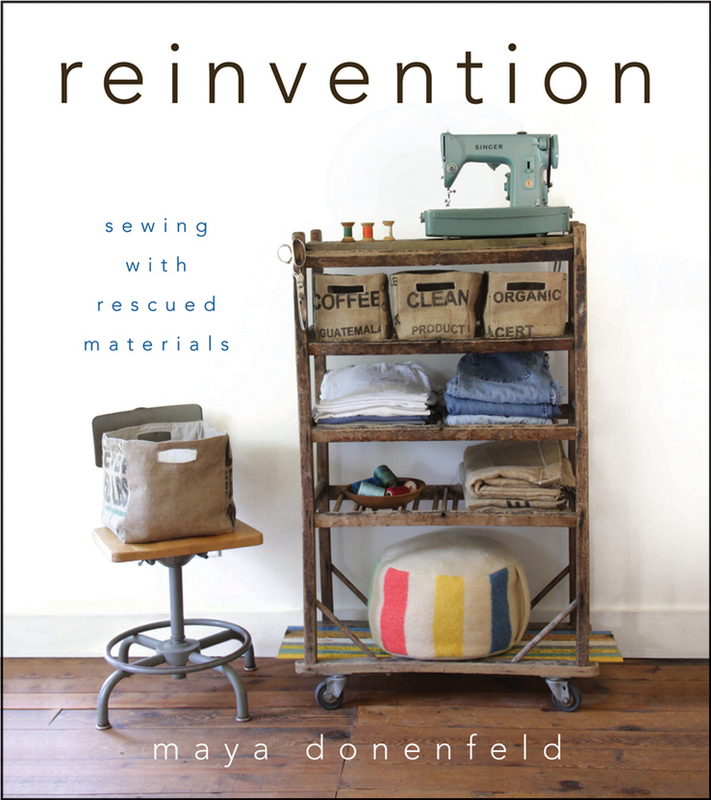 Reinvention : Sewing with Recycled Materials by Maya Donenfeld is a collection of sewing projects that use thrifted and otherwise scavenged materials and turning them into something new. If you love sewing, and recycled projects, this is a wonderful book. The author writes engagingly about her experiences and life, and gives tips for finding the materials for the projects. The techniques include patchwork, stamping and printing. The sewing is all fairly simple, no fancy or fussy seam techniques or anything like that. The chapters are separated by fabric type. Each chapter explains the fabric, a bit about the history, how to take care of it, and where the best places are to find it. She also explains the environmental impact of re-using that particular fabric. The chapters have a few projects each and there is good variety between home decorating projects, clothing, and accessories. Linen- my favorite projects in this chapter are the Story Scarf ,which is a fashion scarf made in patchwork, and the big handy, Reversible Summer Sling purse. My daughter is wild for the Story Scarf, and the Envelope Portfolio which can be customized easily using fabric paint and stencils. Burlap- I get burlap bags every few months from one of the local coffee roasters. We use them for all sorts of things, and this chapter inspires more uses. The Onion and Garlic Sacks are my favorite. My daughter likes the Inspiration Board project. Jersey (tee shirt cotton knit)- My daughter likes the Pillow Pals. My favorite project is a toss up between the simple hand sewn Blossom Band with it's two type of flowers, and the Little Forager Skirt. The reason I love the skirt so much is that even now, it's ideal for my daughter. She's always been a forager, with a sharp eye for anything from washers on a street to use in projects to pretty rocks when we are out on hikes in the summer. Wool - blankets, suits and coats deconstructed to take advantage of the wonderful properties of wool. Great projects in this section. It's my favorite chapter in the book. The Poufs can be filled with scraps from other sewing projects, the insulated lunch bag is something you could use every day, and the Toadstool Cottage is a whimsical alternative to dollhouses. Denim- My favorite project is the Double Duty Oven Mitt , simple seams, and it's a great housewarming gift. I also love the roomy Indi-Go Bag for shopping. My daughter's favorite is the hammock project. Mailers, which uses Tyvek envelopes, is my daughter's favorite chapter. She's been a fan of re-using these for years, and is always really happy when I get mail in them. The insides are canvases ready to be colored, and they can be sewn, glued and taped. I like the Notebook project best as a way to make small memory books. Her favorite is the Banner project. Vintage uses all sorts of vintage textiles, bed sheets, aprons, kitchen towels and table cloths are all used in this chapter. my favorite project is the Traveling Hamper, my daughter loves the Summer Bolster. Spiral bound with a hard outer cover and gorgeously photographed, this is a lovely and inspirational collection of things to make using recycled fabrics. Published by Wiley Books, you can get the book from your local bookstore, or by clicking the Amazon.com affiliate link below.